Lionel Messi has admitted he never thought he would be in the running for this year’s Ballon d’Or — despite leading Barcelona to glory in La Liga and Copa del Rey last season. The Argentina star has won the title five times since 2009 but Croatia midfielder Luka Modric picked up the award in December following his heroics for club and country. Messi finished fifth in the final standings, behind Modric, France World Cup winners Antoine Griezman and Kylian Mbappe as well as long-time rival Cristiano Ronaldo. The result came as no surprise to Messi, who claims he saw it coming from the day the contenders were announced. ‘I heard the nominees for the Ballon d’Or and I knew I would not be in the fight,’ he told Marca. 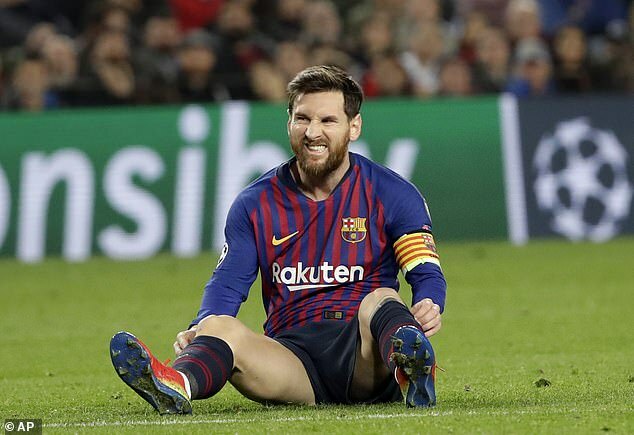 The disappointment does not seem to have affected Messi too much, however, as he continues to set the standard for the La Liga giants. The 31-year-old, who is currently enjoying some well-earned time off, has scored 21 goals and racked up 13 assists in only 20 Barcelona appearances this season. Ernesto Valverde’s side are looking to build on last year’s title win and they currently lead La Liga by three points from Atletico Madrid. They have been helped by the departure of Cristiano Ronaldo, who left rivals Real Madrid for Juventus in the summer and Messi said he enjoyed their battles down the years. ‘The rivalry with Cristiano was very healthy and very beautiful for the spectators,’ he said.